This article presents a comprehensive approach of the diagnosis of anterior uveitis and appropriate investigational tests based on clinical signs. Uveitis has classically been presented by uveitis specialists as an obscure and complicated field in ophthalmology that was supposed to be restricted to the happy few who had the knowledge, which in some countries was even prevented from being diffused. The effect was that ophthalmologists turned away from uveitis or were not correctly armed when they chose to take care of uveitis patients. The consequences of this situation often fell upon the patients. Since more than 15 years our group has been represented by the Society for Ophthalmo-Immunoinfectiology in Europe (SOIE), which has been working to alter this image of uveitis and ensure that the knowledge of the basics of uveitis reaches the practicing ophthalmologist. Our firm believe is that up to 70% of uveitis cases, especially anterior uveitis, can be taken care of by the practicing ophthalmologist following a structured approach in the appraisal of the uveitis case. Judging from the attendance obtained, the response to our approach in every country (where we organise courses) has been inversely proportional to the previous disinterest since we started publicizing it. The diagnostic yield in uveitis has significantly improved in the last 15 to 20 years, in part because a clear classification is available to the clinician but even more so because diagnostic tests have greatly improved lately. With a systematic approach, based on history and clinical examination and guided by laboratory tests and other investigational tests, a diagnosis can be expected in about 70% of cases. A compilatory approach, as exposed in most uveitis textbooks, has to be avoided [Figure 1]a and b. The endless lists of disease, exposure which the patient is supposed to tick on a check-list do not contribute to a diligent work-up of uveitis and are even counterproductive as this may push the clinician in the wrong direction. It is much more productive to use a comprehensive approach that avoids a detailed anamnesis (history) at the beginning of the consultation but limits the initial anamnesis (history) to the immediate complaints of the patient followed immediately with a thorough clinical examination. 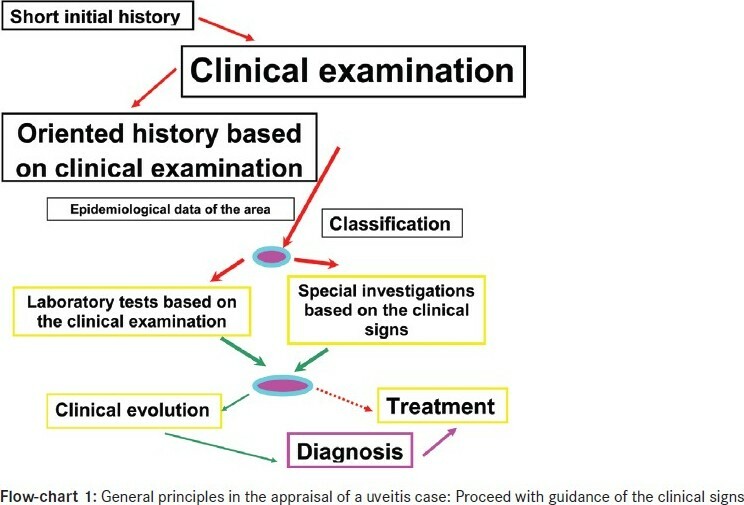 Once the clinical signs have been established and have allowed to characterize the type of uveitis (granulomatous versus non-granulomatous) the anamnesis (history) can be resumed by asking specifically directed questions. The clinician should then try to classify the uveitis more precisely, refer to the local epidemiological data and come up with a working diagnosis, which he should always be prepared to change. At this point, targeted investigations and laboratory tests should be performed. The result is a diagnosis which has a higher degree of probability that can be followed by appropriate therapy. In case no diagnosis is suspected, nonspecific therapy may have to be started or therapy can be withheld. In a proportion of cases the evolution of the disease leads to the diagnosis [Flow-chart 1] - [Additional file 1]. The anatomical classification of uveitis into anterior, intermediate and posterior forms is very useful to conduct the work-up and eventually to reach a diagnosis, even though inflammation does not always respect these anatomical boundaries. Anterior uveitis is the term used for the group of inflammatory disorders for which the preponderant part of the inflammation is situated at the level of the pars plicata of the ciliary body, the retroiridal space, the iris and the anterior chamber. The severity of symptoms in anterior uveitis ranges from no symptoms in chronic disease such as anterior uveitis related to juvenile idiopathic arthritis (JIA) to very severe symptoms in acute uveitis such as HLA-B27 related uveitis. Symptoms of acute anterior uveitis include photophobia, redness, pain, decreased vision and tearing in the absence of discharge. 1. The conjunctival injection in anterior uveitis can be diffuse or localized circumferentially at the limbus (perikeratic injection) or mixed (diffuse and perikeratic injection). 2. The morphology of keratic precipitates (KPs) is very useful to help distinguish non-granulomatous from granulomatous uveitis. Small diffuse KPs causing dusting of the endothelium are characteristic for non-granulomatous uveitis such as HLA-B27 related acute anterior uveitis. When KPs become larger than endothelial dust they can be individualised and correspond to granulomatous KPs. The morphology and distribution of granulomatous KPs is often useful in orienting towards a more specific diagnosis within granulomatous causes [Table 2]. Medium and large size KPs are called "mutton fat" KPs. There is a lot of confusion regarding the characterisation of KPs. In many textbooks only mutton-fat KPs are termed granulomatous and small granulomatous KPs as those found in Fuchs' uveitis are erroneously termed as non granulomatous. Therefore, Fuchs' uveitis is mistakenly classified as non-granulomatous in many textbooks. It is useful to distinguish between fresh and chronic (old) muton-fat KPs. Old mutton-fat KPs tend to be less white, pigmented and less dense in the center. 3. Anterior chamber flare is caused by exudation of proteins into the normally clear aqueous humor from iris vessels or across the ciliary body epithelium following the breakdown of the blood-aqueous barrier. The intensity of flare is measured in a standard fashion following the grading system proposed by the Proctor Group in San Francisco in 1959 [Table 3]. It is, however, only qualitative. A beam 1 mm wide and 3 mm long with the highest light intensity and x 16 magnification on the BQ Haag-Streit slitlamp is used. When the concentration of proteins in the aqueous is very high, they agglomerate and form fibrinous clots, a finding more common in acute non-granulomatous uveitis [Figure 2]. 4. Depending on the amount and composition of aqueous inflammatory proteins adherences between the iris and anterior capsule of the cristalline lens can form (posterior synechiae) [Figure 3] and [Figure 4]. 5. Aqueous cells used to be the reference parameter for inflammatory activity because their evaluation was quantifiable by slit-lamp examination. Nowadays this is no more true when LFP is available. LFP is the quantifiable gold standard to measure inflammatory activity even in chronic inflammation with chronic breakdown of the hemato-ocular barriers, as it has been shown that even when there are no cells; LFP can detect active inflammation that responds to therapy. Grading of cells in the anterior chamber has been standardized by Hogan et al. at the Proctor Foundation in 1959  [Table 4]. It is important to make the difference between pigment clumps and inflammatory cells and examine the anterior chamber prior to mydriasis as cells and especially pigment dispersion can sometimes be seen after pupillary dilatation. 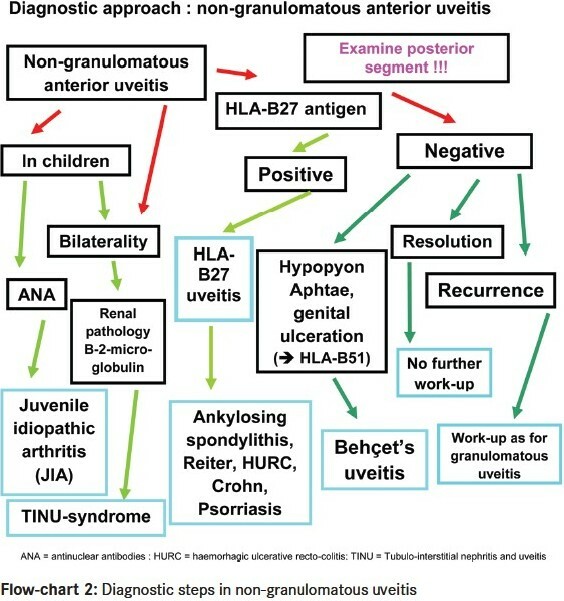 When the quantity of cells is very dense they sediment and cause a hypopyon, a sign more often seen in HLA-B27 related uveitis, Behηet's uveitis and uveitis related to juvenile idiopathic arthritis (JIA) [Figure 4]. 6. In severe and longstanding uveitis iris rubeosis can develop. It is in fact most often a pseudo-rubeosis that is reversible after introduction of anti-inflammatory treatment. Even when a real rubeosis has developed, it is usually situated at the pupillary border of the iris and is much less agressive and proliferative than ischemic rubeosis iridis. In Fuchs' uveitis with extensive iris atrophy iridal vessels can be seen and correspond to a pseudo-rubeosis. Two types of iris nodules can develop in granulomatous uveitis. When situated at the pupillary margin (and on the surface of the iris) they are called Koeppe nodules, have a fluffy appearance and a size going from very small barely visible excresences to frank nodules. When situated in the body of the iris stroma, iris nodules are called Bussaca nodules. 8. Sectorial or widespread iris atrophy is a sign rather specific for herpes simplex or herpes zoster uveitis and is a useful diagnostic help. Diffuse atrophy is very often seen in Fuchs' uveitis. The anatomical diagnosis of anterior uveitis has to be first verified by excluding spill-over inflammation associated with uveitis of the posterior segment (intermediate or posterior uveitis). To exclude posterior involvement pupil dilatation is mandatory in all cases. Secondly, the type of clinical presentation has to be characterized as non-granulomatous or granulomatous in order to correctly orient work-up and differential diagnosis. Non-granulomatous uveitis is characterized mainly by the type of keratic precipitates that presents as fine KPs producing endothelial dusting. In severe cases fibrinous clotting or hypopyon can occur depending on whether protein influx or cellular infiltration is predominant. In case of severe inflammation it is also common to find posterior synechiae and pressure tends to be more often decreased than increased [Table 5]. Granulomatous uveitis is characterized by KPs that are larger than the dusty KPs of non-granulomatous uveitis. They are better individualized but their size varies depending on the inflammatory process. The medium and large size granulomatous KPs are called mutton-fat KPs [Figure 9]. Other characteristic features of granulomatous uveitis are Koeppe and Bussaca nodules [Figure 5]a and b. Synechiae are common in more pronounced inflammation. Pressure changes when present are usually characterized by increased intraocular pressure. Although this distinction is a very useful working classification, the subdivision is not an absolute one. A granulomatous uveitis may initially present as nongranulomatous when dusty KPs are very thick, i.e, before considering its granulomatous aspect. Conversely, in rare cases a non-granulomatous uveitis can take an aspect that might be qualified as granulomatous. In most cases the distinction is however rather well delineated [Table 6]. No further investigation is performed if the episode of HLA-B27 negative non-granulomatous uveitis is of limited severity and/ or responds readily to topical corticosteroid therapy. In case of an anterior uveitis with hypopyon, signs and symptoms found in Behçet's syndrome should be investigated, in particular oral and/or genital ulcerations, cutaneous signs such as erythema nodosum and pustules, arthralgies, thrombophlebitis or central nervous system involvement. If Behçet's uveitis is suspected we find it useful to look for the HLA-B51 antigen which, when present, represents an aditional argument for the diagnosis of Behçet's uveitis, especially in the milder forms of Behçet's uveitis seen in the Caucasian European population. Isolated anterior Behçet's uveitis can occur but posterior involvement should be searched for by funduscopy and is best investigated by performing a fluorescein angiography looking for retinal vasculitis. In case of non-granulomatous uveitis in children (with or without band keratopathy) history should be directed towards juvenile idiopathic arthritis ( JIA). Inflammatory symptoms can be completely absent, contrasting with the severe signs of uveitis such as hypopyon and extensive synechiae that can characterise JIA related uveitis. Uveitis is usually associated with the pauciarticular form of JIA and testing should include anti-nuclear antibodies (ANA) that are present in up to 70% of JRA patients with uveitis. In elderly children it is also useful to test for the presence of HLA-B27 antigen. In children, pars planitis can initially present with a pronounced anterior participation and can be mistaken for an anterior uveitis if the posterior segment is not carefully analyzed. In case of non-responding HLA-B27 negative anterior uveitis or in case of recurrence we pursue the work-up in the same fashion as for a granulomatous uveitis. Before starting the work-up of granulomatous uveitis, it is important to exclude Fuchs' uveitis as this condition, when sufficiently typical, does not need any work-up. Further, corticosteroid treatment should be withheld in Fuchs' uveitis to avoid the side-effects of a treatment that usually has no impact on the inflammatory process. Characteristic findings of Fuchs' uveitis include fine stellate granulomatous keratic precipitates which usually do not accumulate inferiorly by gravitation but are more uniformly distributed over the whole surface of the endothelium, [Figure 6] fine Koeppe nodules at the pupillary edge of the iris, prominent vessels in the irido-corneal angle seen by gonioscopy and absence of posterior synechiae. Heterochromia is only present in fair-colored irises not dark irises. Therefore, the term heterochromic should be deleted for this entity and it should simply be called Fuchs' uveitis. It should be kept in mind that involvement can be bilateral. Laser flare photometry shows a very moderate breakdown of blood-aqueous barrier of 10.2 ± 3.5 ph/ ms (normal 3.5 - 4.0 ph/ ms) that remains relatively stable over time and usually does not respond significantly to anti-inflammatory treatment. Spill-over anterior granulomatous uveitis can occur in very inflammatory toxoplasmic retinochoroiditis which has to be excluded by performing a detailed examination of the posterior segment with funduscopy. The first-line laboratory tests performed to investigate granulomatous uveitis are serum angiotensine converting enzyme (ACE) and lysozyme, products indicating the presence of granulomatous lesions. ACE can be normally elevated in children and serum lysozyme levels tend to be progressively more elevated in elderly persons. It is therefore important to perform both tests. The second step is to differentiate between sarcoid, tuberculous or other granulomatous causes. 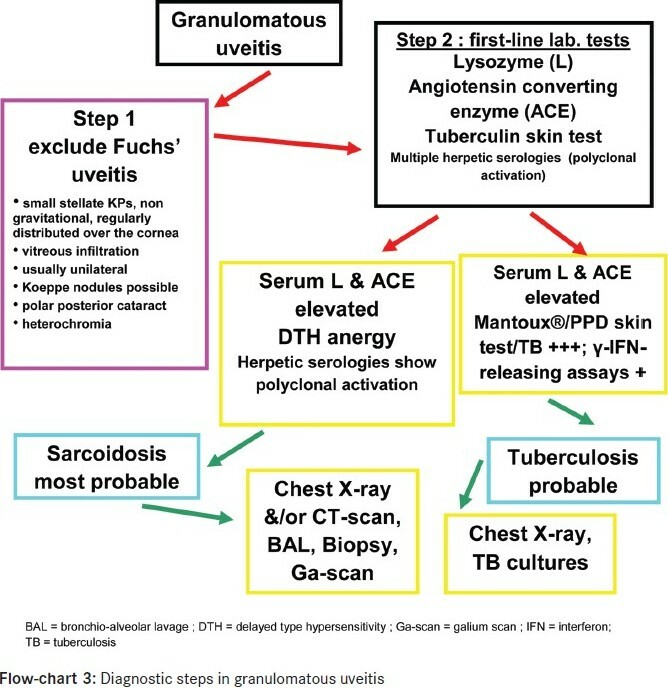 In order to differentiate between tuberculosis and sarcoidosis, multiple skin tests measuring delayed type hypersensitivity reaction to several antigens to which the adult patient should be normally reacting (MultiMèrieux® containing tuberculin, streptococcus, diphteria, tetanus, tricophyton and candida antigens) are performed to search for anergy, a strong argument for sarcoidosis. These tests are, however, rarely performed nowadays as the Merieux® multi-antigen applicator is difficult to find. In a patient vaccinated for tuberculosis or known to have been exposed to a tuberculous infection a PPD skin test which has become negative has the same diagnostic value. We find it also useful to look for polyclonal antibody activation that is present in up to 85% of the patients with sarcoidosis , and was also found in patients with ocular sarcoidosis. For this purpose, serologies to four herpes viruses to which most of the adult population has been exposed (herpes simplex, herpes zoster, cytomegalovirus and Epstein-Barr) are performed. ELISA serology detects exposure to these viruses and complement fixation serology is done to establish whether the antibody titers are elevated. An isolated elevated titer to only one virus might be indicative of a viral etiology. Syphilis serology is performed either routinely or in case of a positive history. In case of undefined diagnosis, serology for Lyme borreliosis is performed with the known limitations of the value of a positive serology. Toxoplasmic retinochoroiditis can sometimes present as a granulomatous (hypertensive) anterior spill-over uveitis. The presence of a retinal focus orients clearly into this direction. In order to make the diagnosis possible toxoplasmic serology should be performed to show the presence of IgG antibodies indicating that the patient has been in contact once in his life with Toxoplasma gondii. In case of negative ACE/lysozyme test and a non-contributary skin test a herpetic uveitis should be suspected. Clinical signs that are very suggestive of herpes simplex/zoster uveitis are ocular hypertension and iris atrophy (found both in herpes simplex and varicella-zoster uveitis). Laboratory confirmation of herpes simplex/zoster anterior uveitis can be obtained by the detection of intraocular production of antibodies in the aqueous humor (Goldmann-Witmer coefficient). Aqueous paracenthesis is, however, not performed routinely in these cases but reserved for sight-threatening diseases such as necrotic herpetic retinopathies (NHR) that include acute retinal necrosis. It is also performed in uveitis suspected to be herpetic but that does not respond to classical combined systemic antiviral and topical steroidal therapy to detect CMV DNA in the aqueous. 1. Hogan MJ, Kimura SJ, Thygeson P. Signs and symptoms of uveitis: 1: Antrior uveitis. Am J Ophthalmol 1959;47:155-70. 2. Herbort CP, Guex-Crosier Y, de Ancos E, Pittet N. Use of laser flare photometry to assess and monitor inflammation in uveitis. Ophthalmology 1997;104:64-72. 3. De Schryver I, Rozenberg F, Cassoux N, Michelson S, Kestelyn P, LeHoang P, et al. Diagnosis and treatment of cytomegalovirus iridocyclitis without retinal necrosis. Br J Ophthalmol 2006;90:852-5. 4. Tran VT, Auer C, Guex-Crosier Y, Pittet N, Herbort CP. Epidemiological characteristics of uveitis in Switzerland. Internat Ophthalmol 1995;18:293-8. 5. Mackensen F, Smith JR, Rosenbaum JT. Enhanced recognition, treatment and prognosis of tubulointerstitial nepritis and uveitis syndrome. Ophthalmology 2007;114:995-9. 6. James DG, Williams WJ. Immunology of sarcoidosis. Am J Med 1982;72:5-8. 7. Daniele RP, Dauber JH, Rossman MD. Immunologc abnormalties in sarcoidosis. Ann Intern Med 1980; 92:406-16. 8. Berthoud-Kόndig JF, Keller A, Herbort CP. Elιvation polyclonale des immunoglobulines: une aide plutτt qu'un piθge dansle diagnostic des uvιites causιes par la sarcoidose. Klin Montsbl Augenheilkd 1994;204:323-9. 9. Baarsma GS, La Hey E, Glasius E, de Vries J, Kijlstra A. The predictive value of serum converting enzyme and lysozyme levels in the diagnosis of ocular sarcoidosis. Am J Ophthalmol 1987;104:211-7. 10. Itty S, Bakri SJ, Pulido JS, Herman DC, Faia LJ, Tufty GT, et al. Initial results of Quantiferon-TB Gold testing in patients with uveitis. Eye 2009;23:904-9. 11. Lim JI, Tessler HH, Goodwin JA. Anterior granulomatous uveitis in patients with multiple sclerosis. Ophthalmology 1991;98:142-5.